He’s left crosses at Ground Zero in New York City, in New Orleans after Hurricane Katrina, Dallas after a gunman ambushed police officers, and most recently, after the school shooting in Parkland. With a simple greeting and wearing a navy-blue coat that reads “Chaplain” across the back, Bob Ossler is a constant these days. 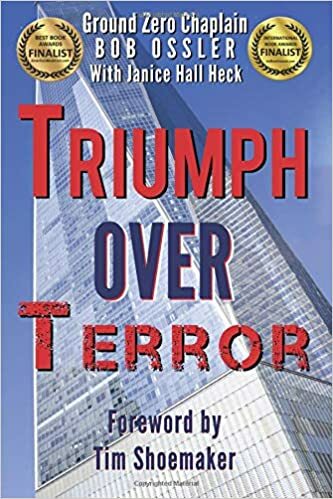 Chaplain Bob is the author of Triumph Over Terror, an eyewitness account from a first responder at Group Zero on 9-11 that recounts the questions, fears, struggles, and sacrifices of the families and workers overwhelmed by despair. Bob knows how to give his book feet. Bob is a chaplain with a heart for victims of terror. He lives out what he believes and his book goes with him on his journeys. Books are inanimate objects. They cannot move or talk on their own. You, the author, must give your book feet. You may not have the mission or ability to travel as far and wide as Bob does, but you can still give your book feet. You may not be as extroverted and easily able to talk and pray with people as Bob is, but you can still give your book feet. You can follow Chaplain Bob’s example to give your book feet. Like Bob, you can take your book with you wherever you go, broadening your book’s audience and reach. Know what need your book meets and who struggles the most with this need. This is your target audience and the people you should focus on as you take your book with you. Bob knows that his target audience are people impacted by terrorist activity. Always have a copy of your book near. Carry them in your car. Carry your author business card or bookmark featuring your book in your purse or wallet. Look for opportunities to connect with others around the subject matter of your book. Bob travels to places that have experienced terrorist activity. He brings hope to victims through prayer and kind actions. In this way, he is connecting with others around the subject matter of his book. Don’t be shy about your actions. If you, like Bob, are doing something good for the community, let the local news know about it. People need to be encouraged and having good-will stories reported encourages people. It can also bring attention to your book. Share your actions and your book’s journey on social media. Chaplain Bob readily shares on social media about the people his book has touched, about responders and victims he admires, and about his care for those who are impacted by terrorist actions. Here’s a recent Facebook post from Bob sharing about his book. Photo courtesy of Ian Baldwin. Glaciers get a bad rap. We often talk about how slow they are. But the speed isn’t the point. The fjord near my house, surrounded by huge cliffs, was formed by a glacier. Not because it was slow, but because it was large, clearly directed, and relentless. Glaciers make a huge impact. They don’t etch out mere creeks, they carve gorges and canyons. Authors can take a lesson from glaciers. While you might not be huge like a glacier, you can make an impact by being clearly directed and relentless—even moving at a slow pace. Do you have a clear direction? Do you have an end goal in mind with well-laid out objectives to reach your goal? Without a clear goal and direction, we wonder all over the place and end up making less impact. People walk the straightest path when they have their eyes fixed on a distant object. Set a goal and keep your eyes fixed on your goal. For every activity you do related to your book, ask yourself whether this activity is moving you closer to your goal. Spend your time and energy on the activities that move you in the direction you want to go. We expect immediate gratification for our efforts. Our culture has taught us that things should come fast and easy. Get rich quick schemes abound. There are hundreds of gurus on the Internet willing to teach you a few easy steps to grow your business exponentially. The sad truth is that it only works for a handful of businesses. Most business grow slowly and steadily over time. Glaciers are slow. You don’t see the impact they are making right away. It can take years before you see the change that a slow-moving glacier is making on the earth. The same may be true for your efforts. It may take years before you see the impact your books and writings are having on people. Being relentless is about perseverance. Writing and marketing your books takes a lot of perseverance. It takes an average of seven contacts to secure a media interview. It takes about nine months of regular blogging to develop a following. If your books bring glory to God, then it is God who is building your house. Your job is to be diligent and God’s job is to do the building. You can make an impact. Don’t rush it. Move carefully and deliberately, trust God, and when you look back, you will see the fruit of your efforts.